In a desperate attempt to save the Bathurst caribou herd from extinction, the government of the Northwest Territories banned the fall hunt for the second year in a row. The restriction puts local communities under pressure to find alternative foods – and may not be enough to save the herd. The freezers of the Dene First Nation are usually packed full of caribou meat by this time of year. But with a hunting ban in effect for the Bathurst caribou some remote communities are going without their main traditional food this winter. “It’s a food source that people relied on heavily in the past, as they do now,” said John B. Zoe, who lives in Behchoko, a small aboriginal community an hour’s drive northwest of Yellowknife. The Dene and other indigenous groups in Canada’s Northwest Territories, a sparsely inhabited area nearly as large as Alaska, have hunted caribou for thousands of years, relying on the animal’s meat for subsistence and the hides and sinew for clothing, shelter and drums. Within the territory, the Bathurst caribou has traditionally been the largest and most important herd, with its population reaching an estimated 470,000 animals in 1986. Since then, however, the herd size has plummeted to just 20,000 – a staggering 96 percent decline, according to surveys done last summer by the territorial government. Equally troubling, the number of breeding females – a crucial indicator of a herd’s health – has dropped by more than half since 2012. Last October, for the second straight year, the Northwest Territories government banned hunting of Bathurst caribou in a last-ditch effort to save the herd. The ban applies to commercial, recreational and indigenous hunters. 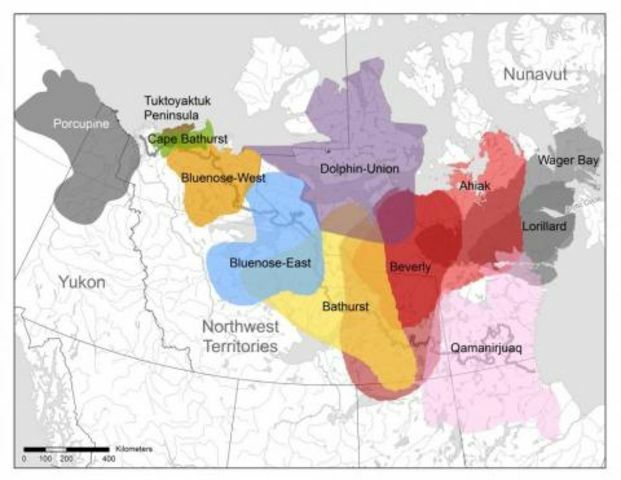 A recently released Bathurst caribou management plan, prepared jointly by territorial and aboriginal leaders, recommends extending the ban for at least another two years to June 2018, when the next calving ground survey is done. The management plan, which will go to the Wek’eezhii Renewable Resources Board for approval in late February, also includes measures to cull wolves, the caribou’s main predator, and to increase monitoring of the herd using satellite radio collars. While it’s a big step forward toward saving the herd, the management plan doesn’t include the portion of the Bathurst’s range that falls in Nunavut, where hunting is still allowed. It’s estimated that less than 100 Bathurst caribou are shot in Nunavut each year – a small number relative to the overall herd size, but the inconsistency has irked Northwest Territories’ conservationists and hunters. “The reality is that the [herd] numbers are so low that a serious look has to be taken,” said Zoe, a senior advisor with the Dene’s Tlicho government, which has self-authority over an 840,000-square-kilometer (324,000-square-mile) area north of Yellowknife that overlaps with much of the Bathurst’s range. Zoe said that drastic conservation measures are needed but he worries, too, about the fate of the people who live along the caribou’s migratory path. There, the hunting ban has been most controversial, but most of the opposition has quietened down since the herd’s 2015 numbers were released. At this point, all the chiefs support the hunting ban. “Their communities are situated for game – for harvesting – and they’re not necessarily designed to become an industrial community,” Zoe said. There are ten aboriginal communities within the Bathurst’s range, including four – Behchoko, Gameti, Wekweeti and Whati – within the Tlicho land north of Yellowknife. These remote settlements, often built where traditional hunting camps were once located, typically have only a few hundred residents and are far removed from highways. Any food that can’t be hunted, trapped, gathered, grown or fished must be flown in or driven by truck over treacherous winter roads built on frozen lakes and tundra. Shorter, milder winters in recent years have made these roads even less dependable. Grocery prices in remote communities in the Northwest Territories can be double or even triple that of southern cities. A 2015 Food Banks Canada survey found that one in five households in the Yukon, Northwest Territories and Nunavut skip meals because there isn’t enough food in the house or eat poor-quality food because they can’t afford better. People living in the three territories consistently rely on food banks more than any other province in the country. Although the consumption of caribou meat has lessened over time as store-bought food has become more available, it still has a critical place in northern diets. According to surveys done by the Centre for Indigenous Peoples’ Nutrition and Environment, Dene people derive between 5 and 30 percent of their diet from traditional food. The highest rates of consumption are found in more remote communities and among older people. Among traditional foods, caribou is by far the largest source of calories for northern indigenous people, said Harriet Kuhnlein, a nutritionist and founding director of the Centre. Caribou meat is also rich in nutrients like protein and iron that would otherwise be lacking in aboriginal diets, due the steep price of store-bought meat. “If they’re not eating traditional food, they’re simply not getting these nutrients,” said Kuhnlein. In her research among Inuit communities, Kuhnlein has seen a sharp increase over the last decade in obesity and diabetes rates, as people have consumed more store-bought food – often high in sugar and fat. The trend is likely much the same among Dene people, she said. “It’s all around the quality of food [available] and the fact that people are buying poor-quality food with the little money they have,” she said. There’s no easy way to compensate for caribou, said Kuhnlein. To do so, stores would have to carry fresh, nutritious food at prices local people could afford – likely requiring government subsidies to fully offset the cost of transportation. More education would also be needed to change established eating habits to healthier ones. And that still doesn’t address the other dimensions of eating traditional foods, including the cultural, spiritual and social aspects, said Kuhnlein. The hope, of course, is that the Bathurst caribou recovers and that the Dene First Nation and other communities will be able to return to the hunt. It’s not the first time that the herd has declined. Caribou populations tend to fluctuate widely, going through boom-to-bust cycles that roughly coincide with long-term Arctic climate patterns. And there’s precedence that hunting restrictions can work: the Porcupine caribou herd, which ranges in Alaska, Yukon and western Northwest Territories, had harvest limits placed on it 10 years ago and has since rebounded to record numbers. But wildlife biologist Anne Gunn, who coauthored an ecological assessment of Canada’s caribou herds in 2010, isn’t optimistic about the Bathurst herd. She believes multiple factors are combining to create a perfect storm this time: “It’s climate change, it’s resource extraction, it’s winter roads, it’s commercial and subsistence hunting,” she said, all of which are tipping the ecosystem badly out of balance. 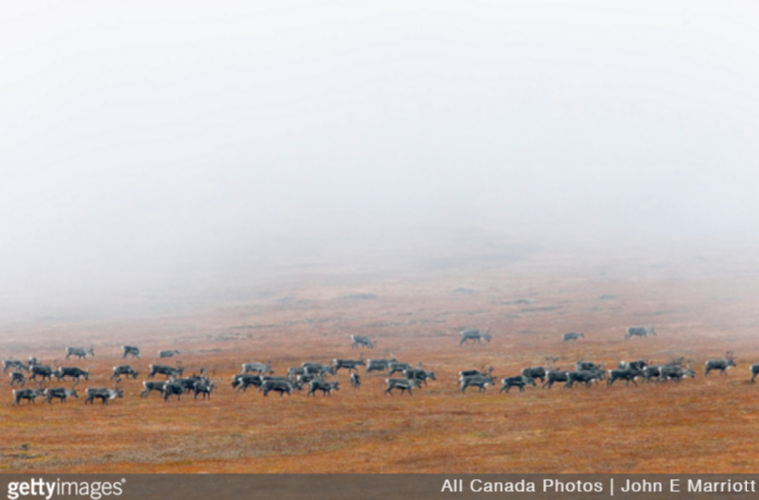 Other caribou herds are struggling as well. The Cape Bathurst herd, a small herd that ranges on the northern tip of the territory, has only 2,260 animals left, down from 19,000 in 1992. Hunting the Cape Bathurst herd has been banned since 2005. The Bluenose East herd, whose range overlaps with that of the Bathurst caribou territory, has dropped by more than 50 percent in the past five years, to roughly 40,000. In the fall of 2015, 1,800 hunting tags for the Bluenose East herd were issued for indigenous hunters in the Northwest Territories, but no restrictions are in place in Nunavut. Throughout the northern hemisphere, in fact, caribou (and reindeer) are disappearing at an alarming rate. The global nature of the trend has scientists pointing to climate change. A 2013 paper published in the journal Nature Climate Change found that with warmer weather, undisturbed lichen-rich environments that caribou depend on for food are quickly being replaced by shrubs and trees. Other researchers have reported that forage plants are reaching their peak nutritional value weeks ahead of calving season, leading to higher mortality in newborns.